It seems like Summer has made it, and it gets really hot here in Georgia, my home state. I am not going to complain after the long cold Winter we had. I'm sure some of you had a lot worse weather than us. We don't usually have freezing cold very much, but we had plenty of it this year. Enough talk about the weather, now we are going to talk drums. That's something all we drum fanatics like to talk about. The set from my collection I want to show you this month is a very cool 1990s Page Drums custom set. I first saw a set of these unusual drums on a television show. The show was called "Celtic Thunder". The musicians and singers were awesome to say the least, and the drummer was playing a set of these rope tension drums. I fell in love with the huge sound and the distinctively vintage look of the kit. I could easily see the large Page logo on his bass drum, so I started researching the drums and looking for a kit to buy. The Page Drums were originally a product of a partnership of David Page and Jeff Hudson. Page Drums was a custom drum company from San Diego, California. This kit has a unique hemp rope tension design. 100 percent Keller 8 ply maple shells on toms and 10 ply on bass. The shells have no holes in them and the shells float between the 2 heads. These were billed as the most resonant drums on the planet. "Each Page Drum is independently hand-crafted, made from the finest maple shells and hardware, stained or covered, and sized entirely to your specifications. The look of Page Drums is both classic, and uniquely your own. Originally introduced at the 1992 NAMM show, and twice nominated for "Best Acoustic Drum". Page Drums are the only totally resonant drum on the market. 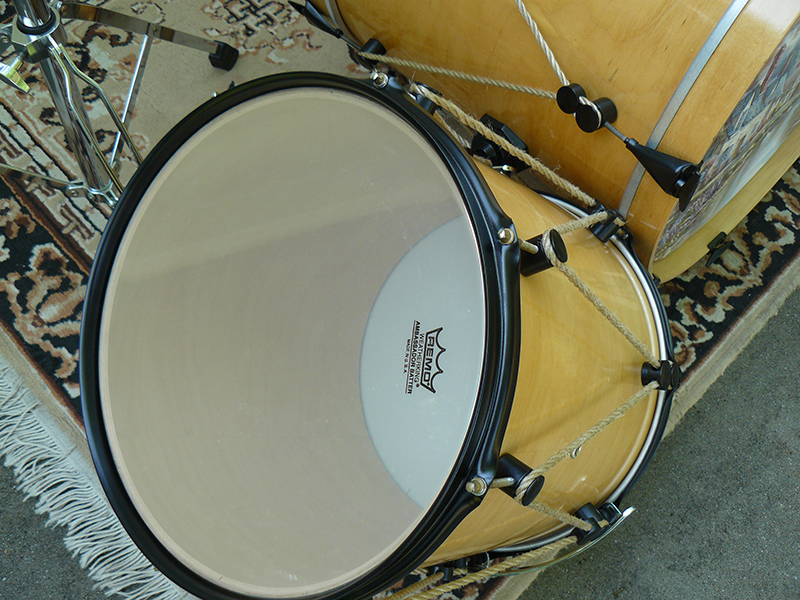 David Page has created a drum with absolutely no hardware attached or drilled into the shell. This concept completely eliminates any rattling or buzzing sounds." The sizes of the drums are: bass drum 22"X18". Floor tom: 14"X14". Tom: 12"X12". Tom: 10"X10". The non free floating snare is a crackling 14"X3". The hardware is black powder coated. The tom Mounts are a combination of Rims mounts and Drum Workshop. The rope tension is very cool. The rope is pulled around the floating lugs with the tension rods loose. The rope is clamped in place and the tension rods are tightened to desired tightness. The extra part at the top floating lug is a sliding tension device like the ones that were on the old rope drums. The ropes are so tight the tension device will not slide down unless you leave the ropes very loose. The ropes will not tighten up "jazz" tight but will get fairly tight. Bottom and top heads tighten up together. The ropes can be replaced with cable to really crank them up. I love the look of the ropes though, and I don't plan to retrofit them with cables. Jeff Hudson is now making these drums and calling them Hudson Custom Drums Los Angeles, California. He has a good website and facebook page. They are beautiful and very unique drums. Everyone that looks at my drums comments on this set. In closing I'll just tell this little story about how I ended up getting this set. I had been looking for a set of Page Drums after seeing the "Celtic Thunder' show on Georgia Public television. I was browsing E-Bay just before going out to dinner. My wife was saying, "Let's go were going to be late," when I saw this set for sale. I could hardly believe it. They were just what I was looking for in the clear maple finish and everything, but there was only an hour left. I said, "Wait honey, I need to bid on this drum set." Let me tell you that set off a firestorm, and I had to work fast. The seller had a buy it now price, but it was high. There was also a make an offer option. I didn't want to lose them, but the thing is I never want to pay full price for anything. I made him an offer, turned off the computer and ran out the door. All through dinner I kept hoping he had accepted my offer. When I was finally able to get back to my computer I was pleased that he had accepted the offer. My wife accepts my "sickness" but she doesn't fully understand it. If you have a set of Page or Hudson Drums please leave a comment. I would like to know what you think of them. Also, leave a comment if you have seen a set of these being used anywhere, or just leave a comment about anything. Sometimes I wonder if anyone is reading these articles.